The Sedona International Film Festival is proud to join theaters around the world to present a one-night only world premiere of Josh Groban’s Bridges Concert from Madison Square Garden on Tuesday, Feb. 12 at 4 and 7 p.m. at the Mary D. Fisher Theatre. The world’s most unmistakable voice returns to the big screen when Josh Groban’s Bridges Concert from Madison Square Garden comes to select cinemas nationwide for a spectacular one-night concert event. Recorded live from the final US stop of his 2018 Bridges Concert Tour at the famed Madison Square Garden, the multi-platinum award-winning singer is joined by Tony-Award winning, multi-platinum recording artist, Idina Menzel along with a special appearance by Sugarland’s Jennifer Nettles. Backed by a 14-piece orchestra and a 5-member band, Josh kicks off the set with “Bigger Than Us” from his newest studio album Bridges. Followed by the 2008 hit “You Are Loved (Don’t Give Up)” and another new tune, “Won’t Look Back”, his buttery baritone shines throughout in an electrifying mix of beloved classics, new songs and special covers including the standard “Pure Imagination”, Billy Joel’s “She’s Always A Woman” and from Les Miserables, “Bring Him Home”. 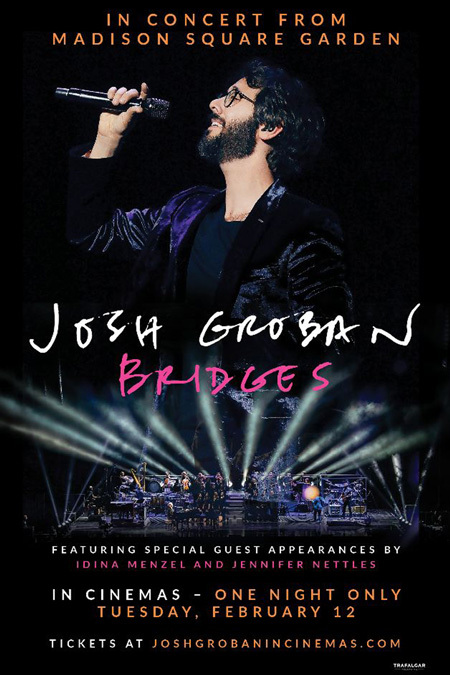 Josh Groban’s Bridges Concert will show at the Mary D. Fisher Theatre on Tuesday, Feb. 12 at 4 and 7 p.m. Tickets are $15 general admission and $12.50 for Film Festival members and students. For tickets and more information, please call 928-282-1177. Both the theatre and film festival office are located at 2030 W. Hwy. 89A, in West Sedona.